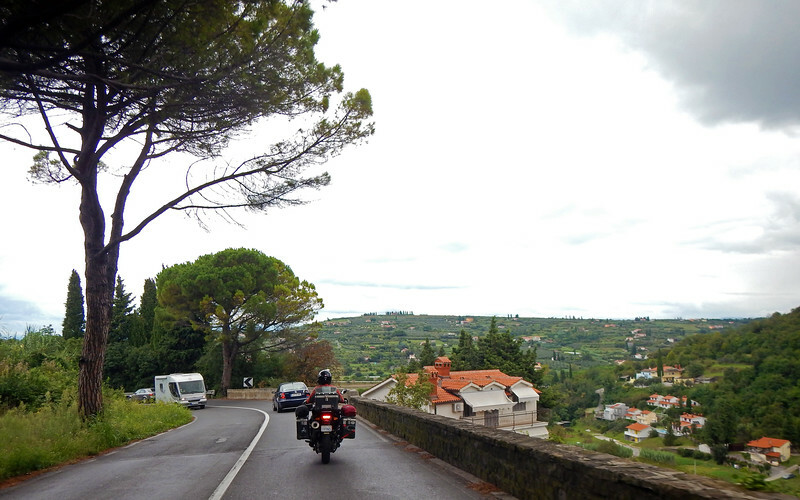 Sep 10 2014: On The Road Again! It's raining. That must mean that it's time to ride! 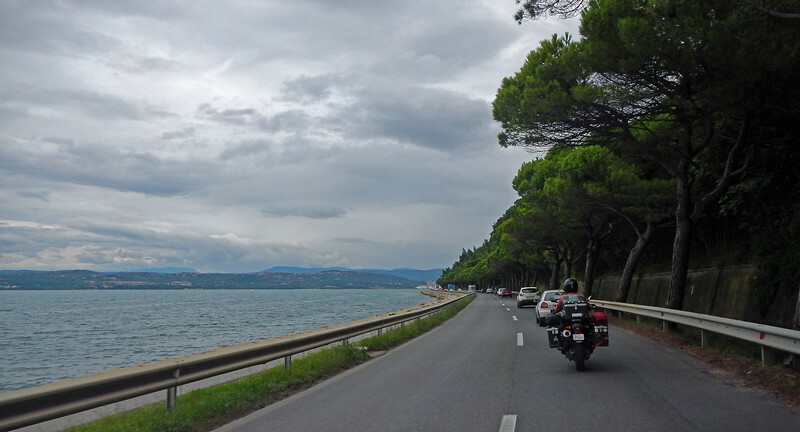 We're leaving Croatia, heading out to explore The Boot across the Adriatic, the home of pizza, Ferrari and crazy Italian drivers! I have a confession to make. The reason why there are never pictures of me riding my bike is because most of the time I'm relaxing comfortably in the support vehicle. We hired a guy named Claudio to take all the pictures and videos of us. When we landed in Europe, we came in on our Canadian passports, but Canucks are only allowed to stay in the EuroZone (called the Schengen Area) for only six months. Luckily, I was born in the UK and Croatia just joined the European Union, so we both got our EU passports shipped to us and seeing how we travel so slow, we can take as much time as want to see Europe. Yay! 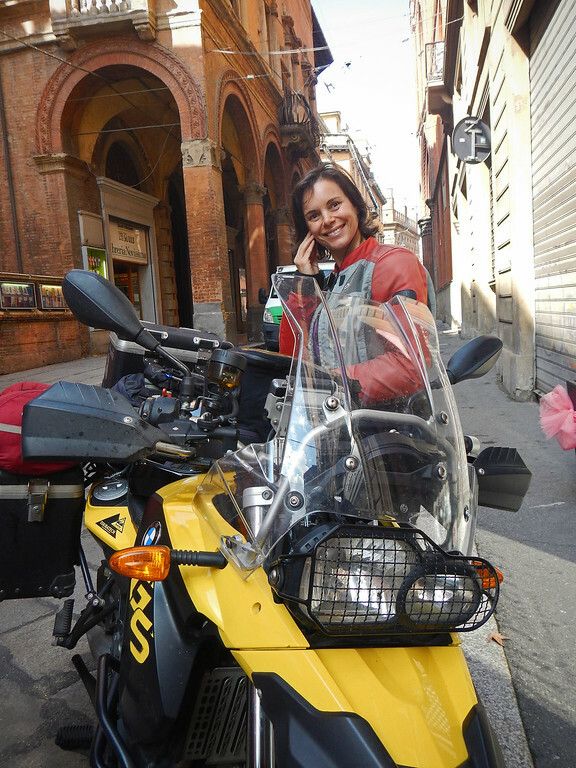 We rode across the top of Italy, rounding Venice towards Bologna, staying mainly on the highways. We were on a bit of a timetable because we had an appointment to make this weekend. 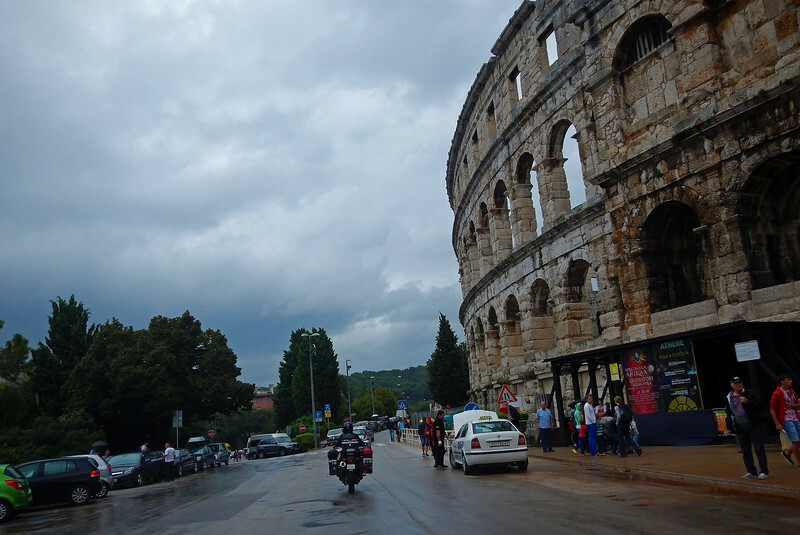 One thing that immediately struck me about Italy was how bloody expensive everything was! Especially gas! 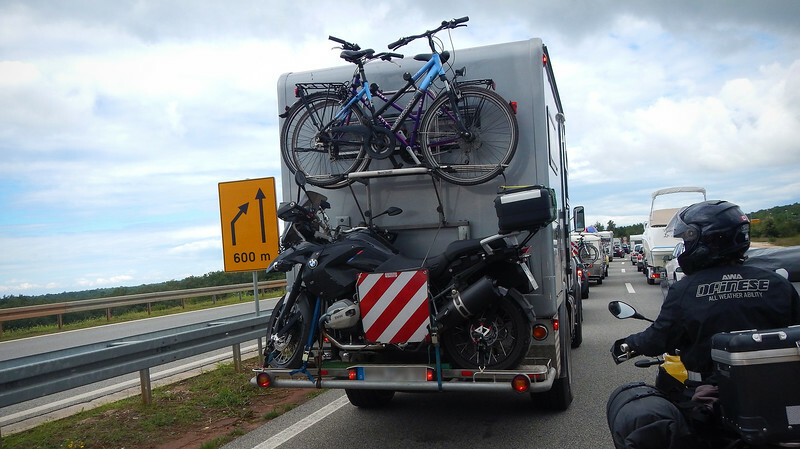 There was a huge line-up at the gas station on the Croatian/Slovenian border. 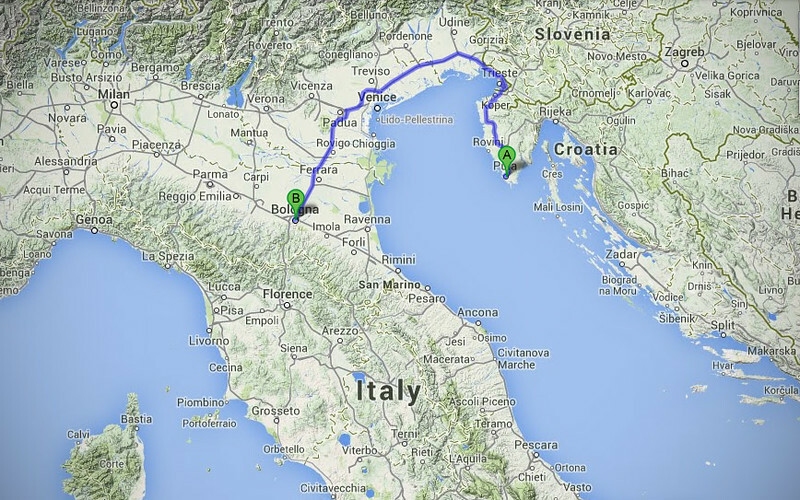 Good thing we filled up because at our next gas stop, we found out the prices in Italy were almost 1.5 times higher! 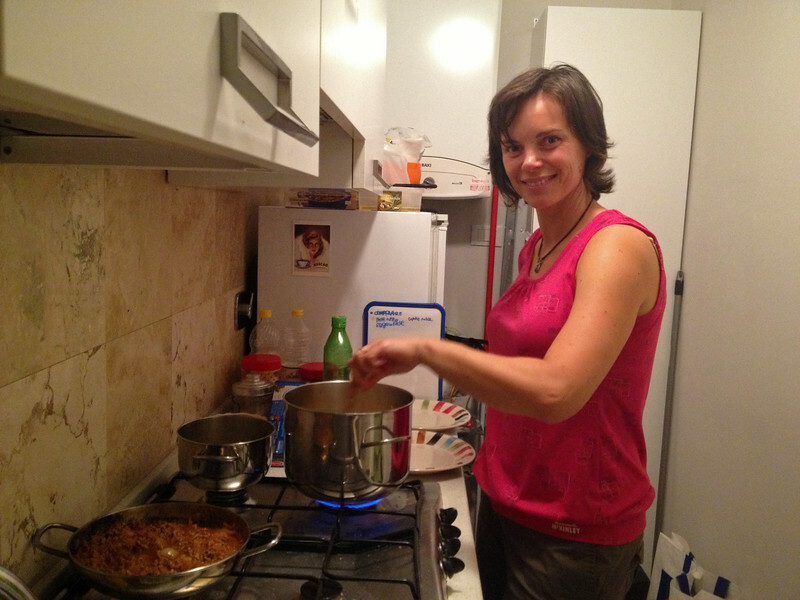 Guess what Neda is cooking for dinner in Bologna? Spaghetti Bolognese! Q: What do you call an Italian with his hands in his pocket? Oh yeah, one thing that is really cheap here is wine. Red wine from Tuscany is less expensive than a bottle of Coca-Cola! It may not have been the good stuff, but it was good enough to put the gigglies into us on the tiny 2nd floor balcony overlooking the urban Bologna neighbourhood we were staying in, while slurping up our spaghetti. 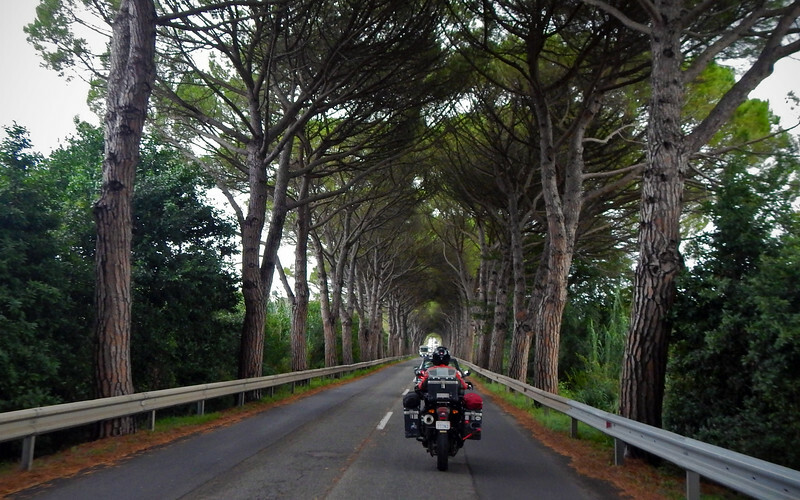 The last time we came to Italy, we stopped into the Ducati factory during Ferragosto, that zany month-long vacation that shuts down the whole country. We only saw the outside of the factory through the fence, but this time we know better. 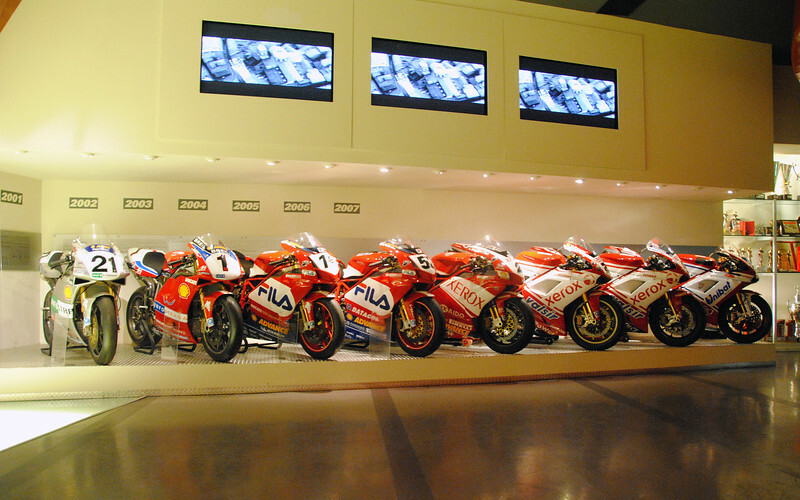 Ducati museum. The centre is shaped like a helmet. Unfortunately, we weren't allowed to take pictures of the factory floor. I was especially intrigued by the race department which was tantalizingly closed off but for a small port window where you could peer through and imagine what sort of wizardry they were cooking up to compete with the big boys. 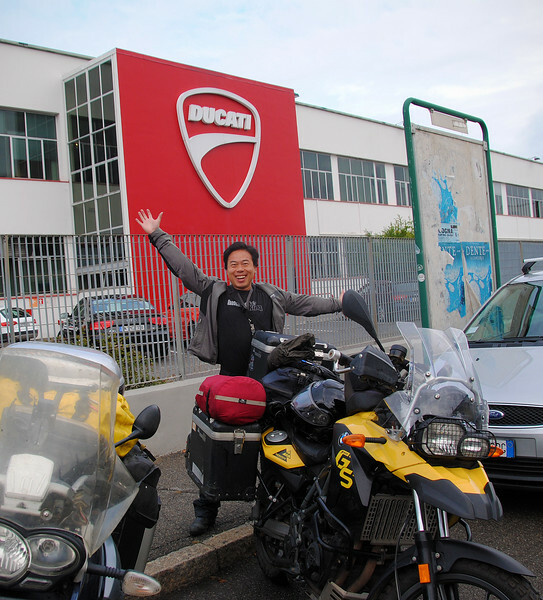 Our tour leader kept quizzing us on our Ducati knowledge to keep us engaged while we walked around. I tried not to be that annoying know-it-all that always raises their hand in class, but since no one else was participating... "The answer is desmodromic, ma'am". Ducati Nerd. ... but for me, this is mine. Super! Interestingly, Valentino Rossi's #46 Desmosedeci is missing from the GP collection. The company sold all of them because collectors offered so much money for it. 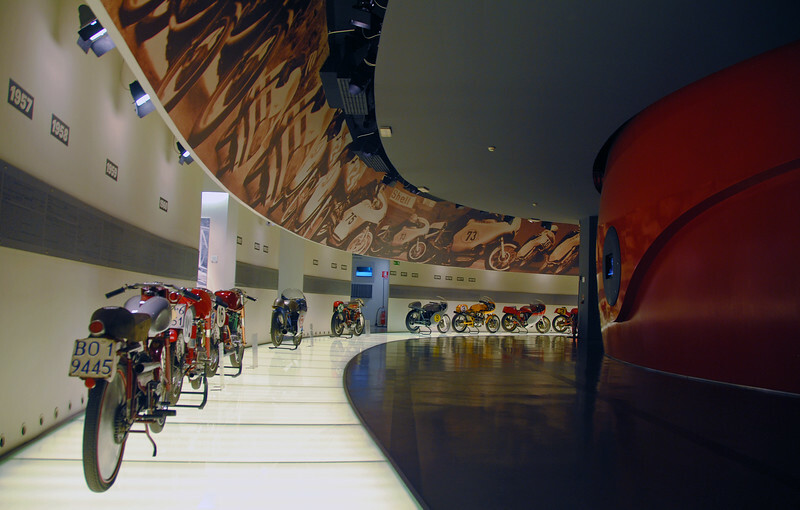 It really shows how small Ducati is, and how willing they are to let a piece of history go to further fund their R&D. I bet Honda still has at least one of Rossi's RC211Vs. Another interesting tibit, the GPs have recently changed color from a deep, rich red, to a more orangey red. The reason why is that the new high-definition cameras that MotoGP uses makes the original red look pink, so the orange-red compensates for that. 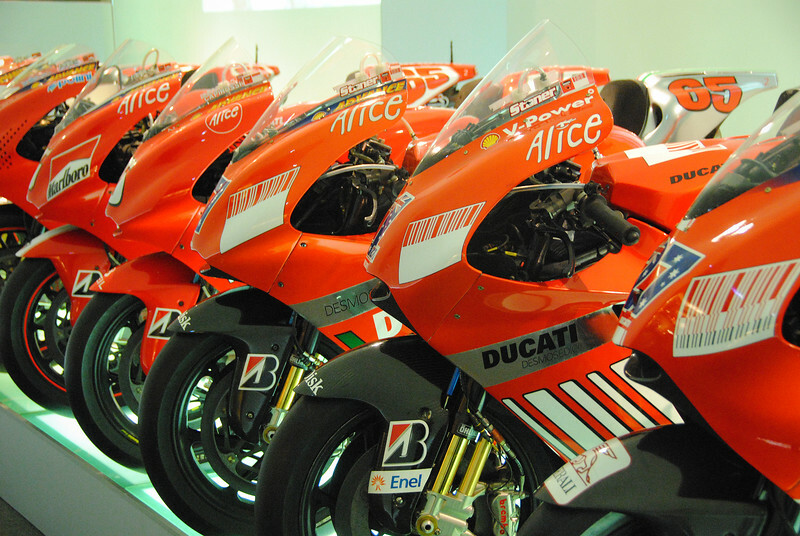 Now viewers at home see the original Ducati Red on their TV screens. Wonder what colour they should paint the bikes to make them appear to win races? 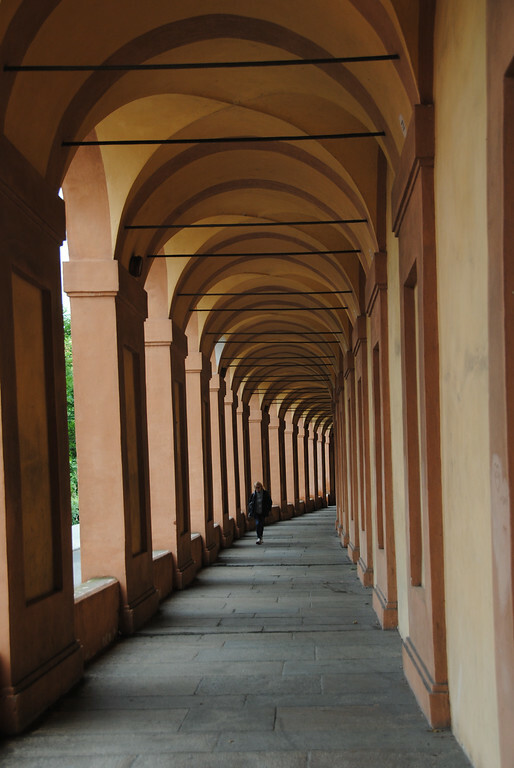 Bologna is home to covered walkways called porticos. 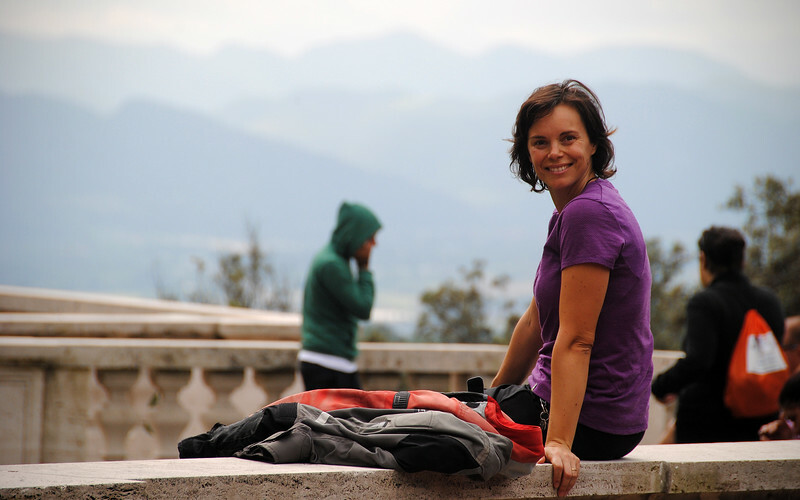 They're used to shelter people from the sun, rain and snow as they walk around the city. 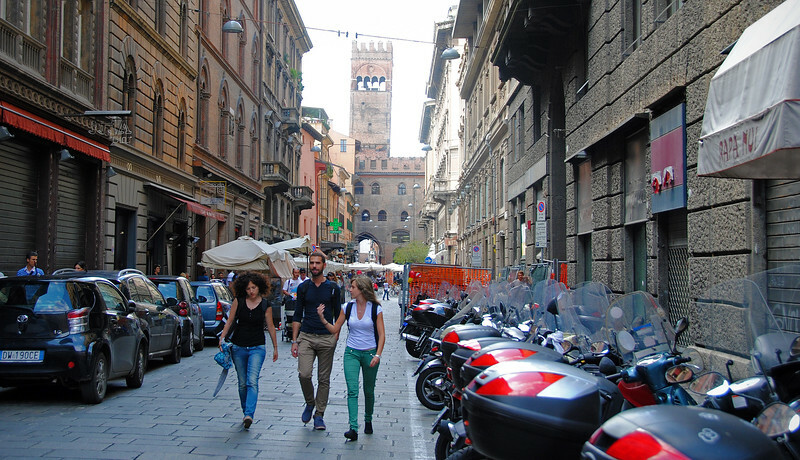 There are about 40kms of porticos in the city. 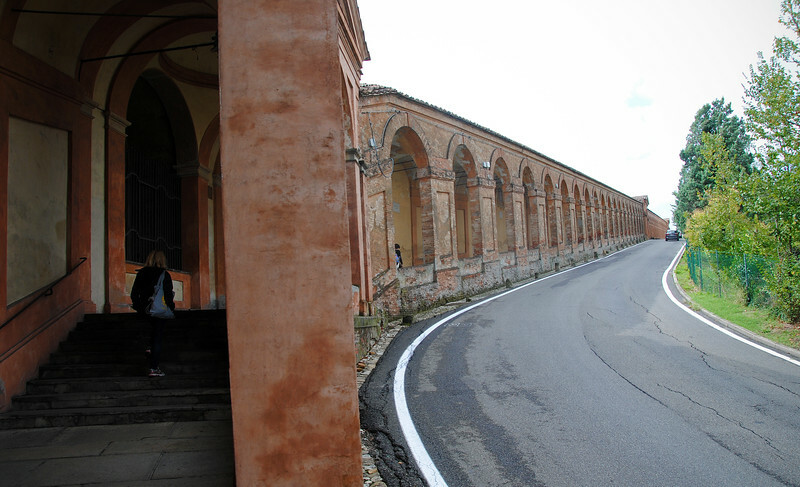 We wanted to stretch our legs a bit after yesterday's ride, so we hiked up the Portico di San Luca, the world's longest covered arcade. 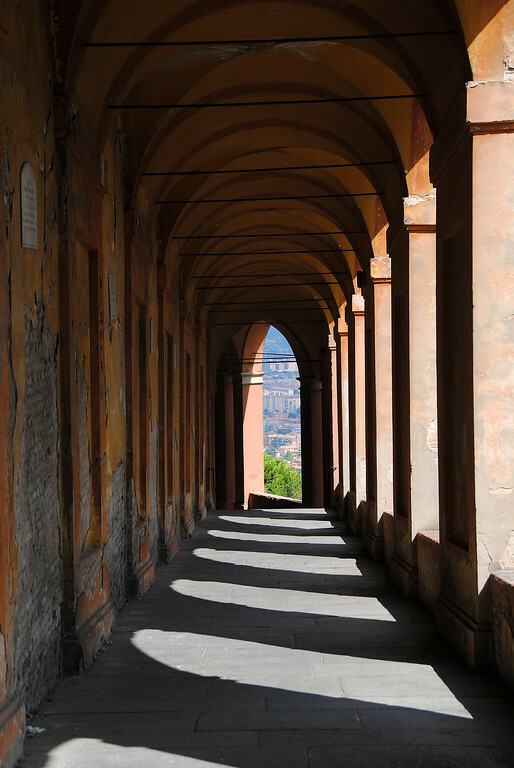 It covers a 3.8km walk uphill to the sanctuary of the Virgin of San Luca and is beautifully decorated with 666 arches that make for amazing studies in Escher-like geometry as it winds up and around the forested hill, Monte della Guardia. We saw lots of joggers and people in exercise clothing do this route. 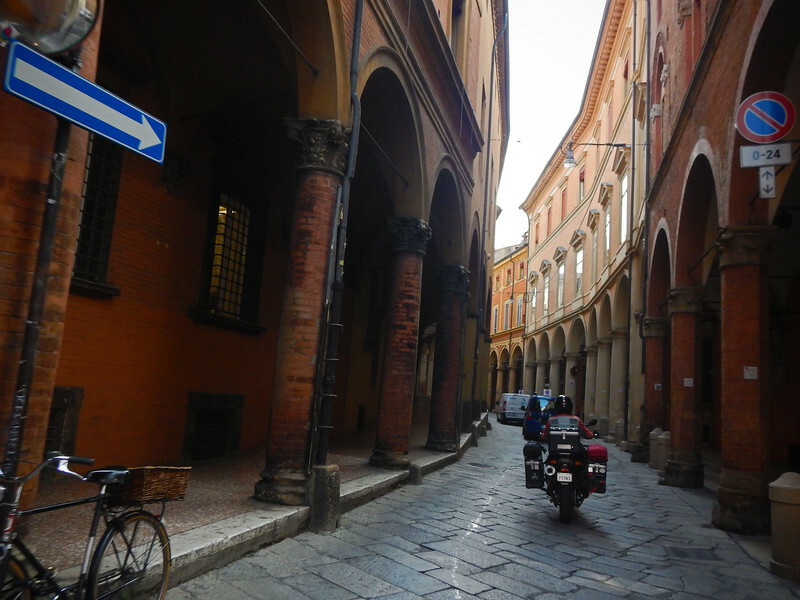 There's all sorts of wonderful medieval buildings right in downtown Bologna. All the buildings there are in that dark, rich reddish-brown that brings up drawbridges and castle sieges, squires and knights that say "Ni!" also has a leaning tower? Actually, it has two of them right downtown! 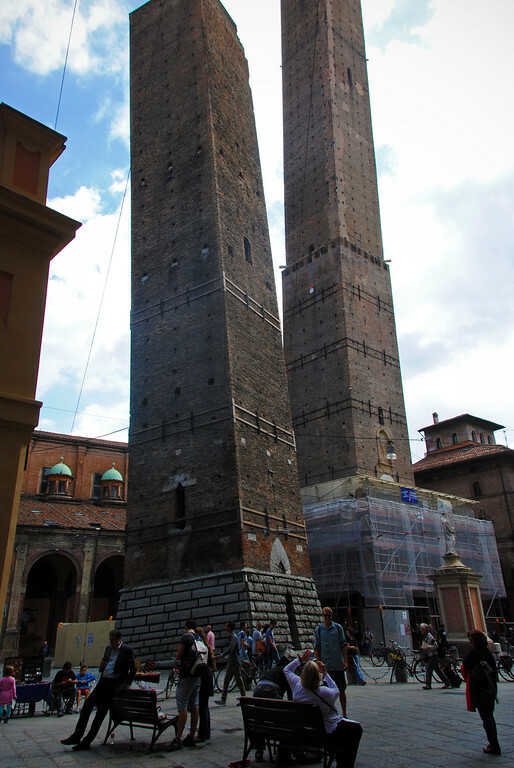 At one time in 12th century, Bologna was actually full of towers like these, they conjecture about 180 of them, like pins in a cushion sticking up in the sky. They say they were used for defense. I think with the way Italians architect their towers, with that built-in lean, they were actually meant to fall down on any invaders (and citizens for that matter). Today only 20 towers exist in the city centre. The Two Towers above are both leaning. The smaller one, Garisenda, has a menacing 10+ foot lean over the heads of passerbys. The taller Asinelli only has a 3 foot lean, but as you can see, construction is underway to increase its lean angle so it can better defend Bologna against invading tourists. Getting ready to hit the road! Where to next?